Napa County is a small county in the Coast Ranges north of San Francisco Bay. The Napa Valley is famed wine country but within the country are salt-water marshes, coniferous forests, oak woods, and rocky chaparral. It was one of the original 27 counties in 1850 and its boundaries expanded and then contracted other the next decade. Lake County was created from its northern half in 1861, leaving it with today's approximate location. I actually spent my freshman year of college in residence in the county (Pacific Union College, Angwin) but did not have a telephoto lens back then. County birding statistics and links are on Joe Morlan's site. John Sterling's introduction to Napa County birding locales is also on Joe's web site. There is a published Breeding Bird Atlas for this county (Berner, Grummer, Leong & Rippey 2003). 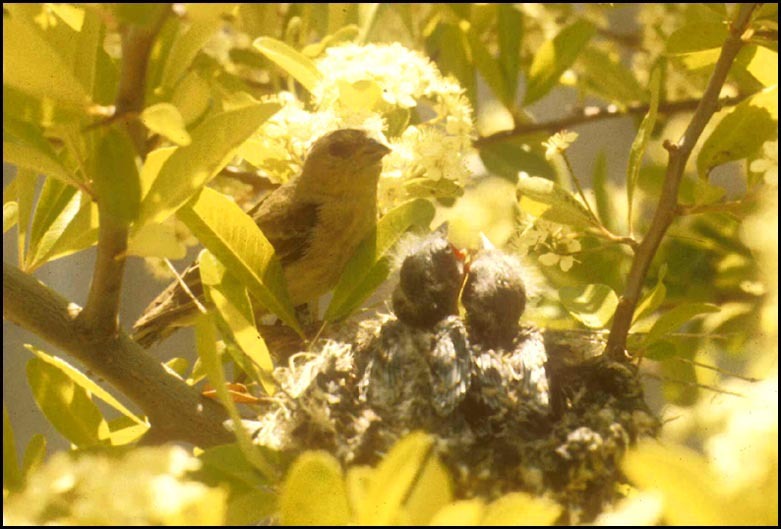 A search through my files located one single photo of a bird in Napa County: the nest with young of a Lesser Goldfinch on the campus of Pacific Union College in Angwin. This shot, taken way back in 1972 and representing the earliest bird photo used in this project, shows the female arriving to feed the youngsters. It was taken with an ordinary camera at very close range (no telephoto lens back then) just by sitting quietly.